eCommerce has overtaken majority of physical market with everything is being sell at online eStores as transactions of millions of dollars happening on daily basis with the help of different online shopping stores. Having said that, PayPal is one of the most popular payment barriers as it holds the major share in the industry. Though, PayPal has expanded the services to provide more set of features to its customers. However, PayPal has some problems Like, most of the developing countries don’t support PayPal that is the reason why people are looking for an alternative that could be a good replacement of PayPal. 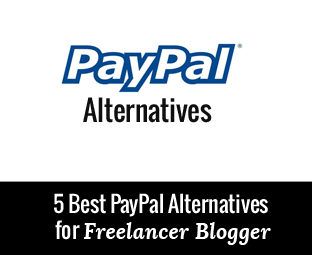 Therefore, today in this article, we will showcase 5 awesome PayPal Alternatives for Freelancer Bloggers. Payoneer is a global payment barrier that provides simple solution to eCommerce companies to provide cash out to their clients directly to their Payoneer debit cards. With Payoneer you can receive payments from PayPal, Visa Cards, and Online banks all across the globe. As a Payoneer customer you get your personal Payoneer debit card though which you can cash out your earning anytime from any ATM machine across your country. The only drawback of is that it charges a lot of fees of transaction plus taxes with an annual fee of $29.95 and a $3.15 are charged each time you withdraw cash from any ATM across your country. Google Wallet previously known as Google’s Checkout is an ideal payment processing service that is used by some of the top quality brands. It has similar features like PayPal, such as credit card attachment and ability to send invoices and etc. Skrill previously known as Moneybookers is another quality alternative to PayPal. The name may have changed but the features are almost the same as it offers you to send payment directly to your bank or debit card almost instantly. A trusted platform by a lot of freelancer and bloggers as it is used by 200 countries over 40 different currencies and it has more than 36 million Skrill cardholders across the world. Stripe is the fastest growing merchant program for freelancer and bloggers. It allows you to send payments to your bank accounts without charging much of taxes or fees. It also accepts all international cards like debit cards, MasterCard’s and etc. If you are from United States, than you can receive your money in about 100 currencies without paying any kind of extra taxes. However, this is only for people living in USA. Though, 2Checkout they have high number of frauds payment, but still they are worth of a company to be mentioned in this list. With the combination of a merchant account, 2CO allows its users to receive payments from credit cards and PayPal. This company also offers a shopping cart feature for eCommerce website with lots of customizable options. Do you think Paypal’s supremacy would be down and dusted? Which of these opponents will be trusting with your business? Share your thoughts and options in the comment below and let the world know what you are thinking. Why Paypal in not available in Bangladesh? This is a custom build template. Must be some issues with Bangladeshi Banking. We'll soon cover a tutorial on it.